Former President George H.W. Bush is reportedly in intensive care tonight following an infection that has entered his bloodstream, according to his spokesman. The 41st President of the United States just lost his wife, First Lady Barbara Bush, to chronic obstructive pulmonary disease (COPD) on March 17th. She was 92. The pair served as the First Couple of the United States from 1989 to 1993 and as the Second Couple from 1981 to 1989. George and Barbara were married for 73 years, longer than any other presidential couple; Bush is currently the longest-lived president in history and the oldest living former president and vice president. Prior to his tenure as President and Vice President, President Bush served as the Director of the Central Intelligence Agency, Ambassador to the United Nations, Chair of the Republican National Committee, and as a Congressman from Texas’s 7th Congressional District. President Bush has experienced major medical issues many times in recent years. He suffers from a form of Parkinson’s disease known as vascular parkinsonism, which has required him to use a wheelchair or motorized scooter since his diagnosis with the condition in 2012. 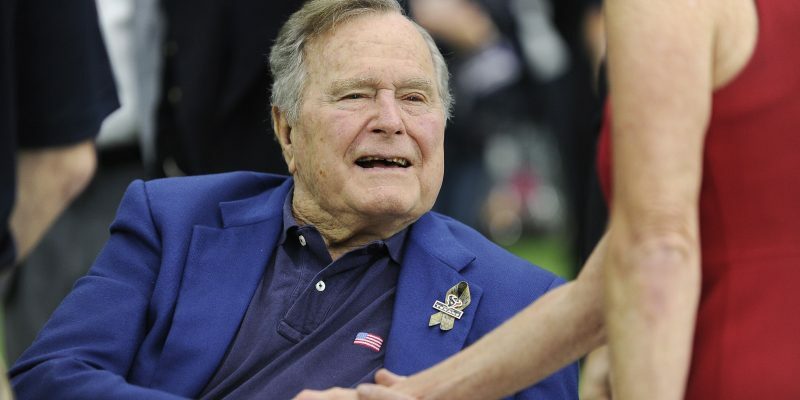 Bush suffered a major neck injury in 2015, requiring him to wear a neck brace. In 2017, Bush was admitted to a hospital twice, both for issues stemming from pneumonia. This prevented the former president from attending President Donald Trump’s inauguration in January 2017. We wish President George H.W. Bush and the Bush family well in such a trying time on the heels of such a major loss for their family.